Detectives believe Matthew Ficken killed himself just as sheriff's deputies were entering the family home on Tuesday to check on his parents, who he had killed five days earlier. 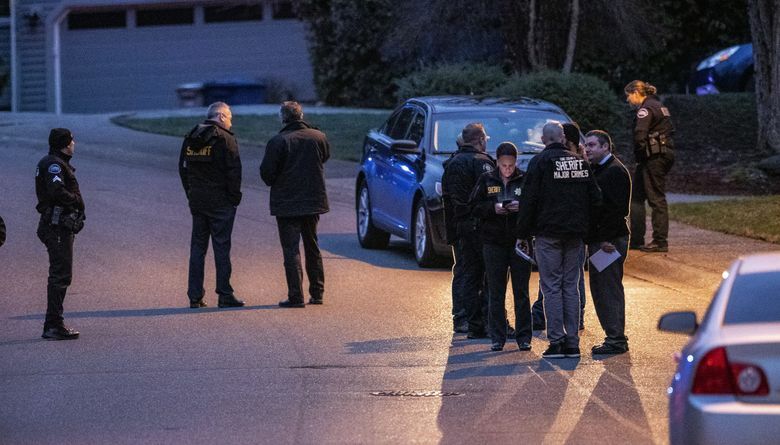 Matthew Ficken shot and killed his parents in their Sammamish house and lived with their bodies for five days before killing himself as King County sheriff’s deputies were entering the home on a welfare check, according to a sheriff’s spokesman. Detectives believe a possible motive was Ficken’s anger over his mother’s announcement that she was moving out of state and that Ficken would have to get his own place, Sgt. Ryan Abbott said in a news release. The King County Medical Examiner’s Office identified Lorraine Ficken, 68, and Robert Ficken, 72, as homicide victims Thursday. Lorraine and Robert Ficken died from shotgun wounds, according to the office. Both died Jan. 10. Matthew Ficken, 34, died Tuesday from a self-inflicted gunshot wound to the head, and his death was ruled a suicide, according to the medical examiner. On Tuesday, a relative in Oregon contacted police in Sammamish and asked officers to perform a welfare check because no one had been able to contact the Fickens, which was unusual, Abbott said earlier this week. Around 1:30 p.m., officers entered a house in the 23900 block of Southeast 42nd Place and found the three bodies inside. Lorraine Ficken was extremely close to her sisters and bought a house in July across the street from her eldest sister in Sherwood, about 20 miles southwest of Portland, her brother-in-law John Mance told The Times on Wednesday. She was getting ready to retire and was excitedly making plans with her sisters, he said. A well-loved real-estate broker, Lorraine Ficken worked in Coldwell Banker Bain’s Issaquah office and had been selling homes since 1992. She and Robert Ficken divorced nearly a decade ago but continued to live together, according to Mance and court and property records. Robert “Bob” Ficken was a gifted historian who wrote books about Washington’s early history. He was awarded the Robert Gray Medal by the Washington State Historical Society for his distinguished and longtime contributions to Pacific Northwest history, according to Charles LeWarne, a fellow historian and author.